Geronimo Stilton is a calm peaceful rodent. His Mousebook page is full of posts about books and antique cheese rinds, along with photos of himself in elegant jackets sitting in his office. And this is just how Geronimo, editor of the Rodent’s Gazette in New Mouse City, likes his life to be. Unfortunately, his friend Bruce Hyena thinks Geronimo needs more exciting and adventurous photos on Mousebook. Bruce arranges two friends, Wild Willie and Maya, to whisk Geronimo off to experience some adventure (and get some good snapshots of course). 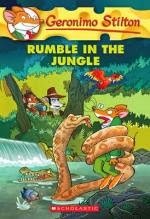 But when they land in Brazil, Wild Willie and Maya disappear, leaving Geronimo, self confessed scaredy-mouse, to negotiate the wild country himself in search of the two lost mice. All the books in the Geronimo series are action packed adventures, filled with colour illustrations, fun facts (in this case on Brazil, the people, culture and language) and humorous word play. Geronimo is a likeable mouse who finds himself in situations beyond his control. He pushes back his fears and carries on regardless, usually winding up the hero. This a fun series for the early primary age and older reluctant readers.